BOZEMAN — Montana State University’s chefs like to know where their local ingredients come from, and last week they returned to campus with mud on their boots to prove it. During a visit to MSU’s Red Bluff Research Ranch near Norris and Montana Highland Lamb south of Whitehall, 10 MSU culinary staff and administrators got a firsthand look at the barns and pastures where lambs ultimately destined for MSU’s Miller Dining Hall begin their days. 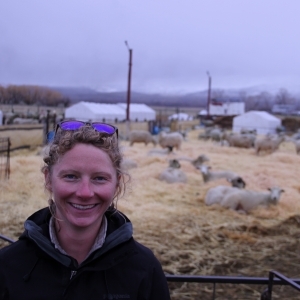 Highland’s Jenny Scott, who co-runs the small ranch with her husband, Dave, guided the MSU guests through a straw-filled lambing barn and alongside outdoor yards where the recently born lambs reposed in plastic warming huts, their fresh coats as white as the snow-covered foothills. Beyond a fence was the pasture where the young sheep will graze from May until September. Highland sells lamb to restaurants and food stores in Bozeman, Helena and Butte, as well as in smaller towns closer to Whitehall. But MSU is the ranch’s biggest customer, according to Scott. “We were inspired and happy when they started buying from us,” which was about three years ago, Scott said. MSU buys meat, vegetables, fruits and other ingredients directly from more than 100 local producers, according to Kara Landolfi, coordinator of MSU’s Farm to Campus initiative. Since 2005, the program has sought to use MSU’s large purchasing power — a result of serving more than 12,000 meals daily — to support Montana agriculture, she said. Currently, MSU spends more than $1.5 million annually on Montana-sourced foods, or about 25 percent of the university’s total food purchases. “It’s an opportunity to develop a connection that you don’t get when ordering commodity products,” said Landolfi, who has organized several staff tours of local ranches, farms and food manufacturers, including Lazy SR Ranch near Wilsall and Wilcoxson’s Ice Cream in Livingston. MSU students and alumni are often part of that connection. That’s especially the case at Red Bluff, where about 10 MSU undergraduates work each semester as interns or paid staff, learning the ins and outs of raising sheep. “We try to keep this hands-on for students,” said Tom Murphy, assistant professor in the Department of Animal and Range Sciences, as he led the culinary staff through the barn at Red Bluff, where spring comes late and the pregnant ewes were just beginning to give birth. Red Bluff began selling upwards of 60 lambs per year to MSU Culinary Services about a year ago, Murphy said. All are males that aren’t being kept as replacements in MSU’s ram development program at the Fort Ellis Research Farm. Prior to that the facility was selling the lambs on the open market. 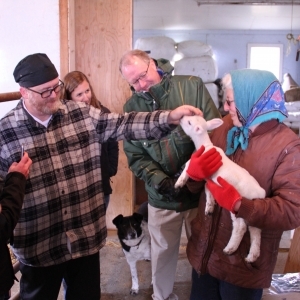 Having the meat prepared and served to the MSU community completes the circle that begins when the students help bring lambs into the world and then tend the flock, Murphy said. It’s also a great way to introduce many students to lamb meat, which in the U.S. is consumed at a rate of only about one pound per person annually, he added. Producers like Jenny Scott, in exchange for showing the MSU staff their operation, are invited to Miller Dining Hall to see — and taste — their product on the plate. The day that Scott came to MSU, Gulley had prepared her lamb, she recalled, smiling. But by the time she grabbed a tray, the lamb was all sold out.